Singer and reality star Trina Braxton ("Braxton Family Values") lands "gig" as co-host of the "Sister Circle" talk show, which airs weekdays on TV One and TEGNA networks from 12:00 p.m. - 1 p.m. (ET) reaching over 60% of the households in the U.S.
"I'm so excited I don't know what to do with myself," said Trina, who holds a Bachelors degree in Communications, about her new job. 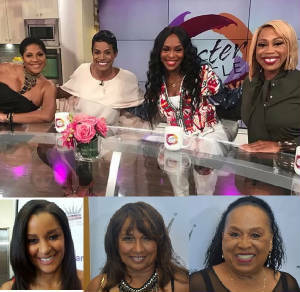 The talk show premiers September 14, 2018 and its returning co-hosts include actress Rashan Ali ("Being Mary Jane"), Grammy Award nominated Syleena Johnson and reality star Quad Webb-Lunceford ("Married to the Medicine"). "Sister Circle" is produced by TEGNA from its Atlanta based WATL station. "When talk show hosts have to take off they call in guest hosts," Trina explained. "One left for three weeks...now with the whole thing with ‘Braxton Family Values' it kind of fell into my lap." Trina Braxton, the youngest of the sisters, isn't new to the lime-light. In 1989, along with her sisters Toni, Tamar, Traci, she signed to Arista Records by Bryant Reid as The Braxtons. Reid was head of A&R at the time. While there the group failed to release an album, but her sister Toni recorded songs for producers Antonio "LA" Reid and Kenneth "Babyface" Edmonds before signing to their Arista distributed label LaFace. Bryant moved to Atlantic Records and took Trina, Tamar and Towanda with him as The Braxtons in 1993 and released "So Many Ways" album. The Severn, Maryland native wants the world to see her as more than a Braxton sister but as an actress, business woman, singer, journalist and one who holds a college degree. As an actress her credits include "Meet the Browns" and Broadway's Dreamgirls as Deena. Let us not forget her talents as a singer. In 2012 she released her solo album "Party or Go Home" (Soltri Entertainment). "They are not afraid to go after their dreams...and I am so happy that Lisa Ruffin is still doing this 25 years later," said actress Ella Royce ("My Wife and Kids") about the 6 - 12 year old contestants of the Little Miss African American Pageant (LMAA). The scholarship pageant, founded by actress/choreographer Lisa Ruffin ("The Raven"/"The Steve Harvey Show"), was recently held in Los Angeles at the Nate Holden Theatre. Ella Royce was one of the pageant judges along with James Pickens, Jr. ("Grey's Anatomy"), Professor Ron Brewington, and actress/comedian Roz Ryan ("The Rickey Smiley Show"). When I asked Roz what she hopes the young contestants get from the pageant, which provides a scholarship to the winner, she said "To understand how special they are. Our girls are growing up to believe they can be who ever they want." With the scholarship from the pageant one of them will have help getting to where they want to go. The 25th annual Little Miss African American Pageant was hosted by actress Penny Johnson Jearld (Star Trek: Deep Space Nine) and reality star Claudia Jordan ("Real Housewives of Atlanta"). "I started at a pageant. Then I was Miss Rhode Island and then to Miss USA," said Claudia about her journey to being a reality star on such high-profile reality shows as "Celebrity Apprentice" and "Real Housewives of Atlanta". "After that I came to Los Angeles with $500 in my picket. These girls are so talented. To see them do their monologues...makes me so proud. Those little 5 and 7 year olds ...it is so cute." The LMAA pageant offered a media filled red carpet arrival and performances by Neo-Soul vocalist Janice Freeman and last years Little Miss African American winner Krista Campbell. The nonprofit program is a educational one, that through the pageant not only will one get a scholarship to further their education, but all contestants receive education through their participation. "Grace, poise, hope, pride," said Ella (Preachers' Kid) about what she saw in the contestants last year. "The way the presented themselves...all the girls are going to fore fill their dreams. They are not afraid to go after their dreams." The pageant provides the young ladies with an introduction to the arts, experience in public speaking and it stimulates their drive to go after their dreams. All of the high-profile entertainment experts there that day seemed genuinely excited with the chance to help provide that experience. SYNDICATED COLUMN: Eunice Moseley, has an estimated weekly readership of over ¼ million with The Pulse of Entertainment. She is also a Public Relations Strategist and Business Management Consultant at Freelance Associates, and is Promotions Director (at-large) for The Baltimore Times. www.ThePulseofEntertainment.com. EVENT: 19th annual "Uplifting Minds II" Free Entertainment Conference Los Angeles on Sat October 20th 1 - 4pm at the Celebrity Centre in Hollywood) with EURweb publisher Lee Bailey, talk show host Melody Trice, television executive Tiaunte Kelly and singer Emmanuel Withers.. Entertainment Business panel and national talent showcase competition (vocal, songwriting, dance and acting) with over $15,000 in prizes. www.UpliftingMinds2.com.